The footballing world will experience the first El Clasico of the 2016-17 season when La Liga leaders Real Madrid travel to the Nou Camp to face second-placed Barcelona on Saturday. This will be the 232nd Clasico in the history of the fixture that dates all the way back to 1929. Barcelona will be looking to grab three vital points in front of their home fans as they look to reduce the six-point gap between them and their arch rivals Real Madrid. No two football matches are the same - this was evident in the scorelines of the two matches in which the sides met last year. Barcelona crushed Madrid 4-0 in the first encounter but slipped to a 2-1 loss later in the season to a Zidane-led Madrid side. Both sides tasted a Clasico defeat in their own backyard. 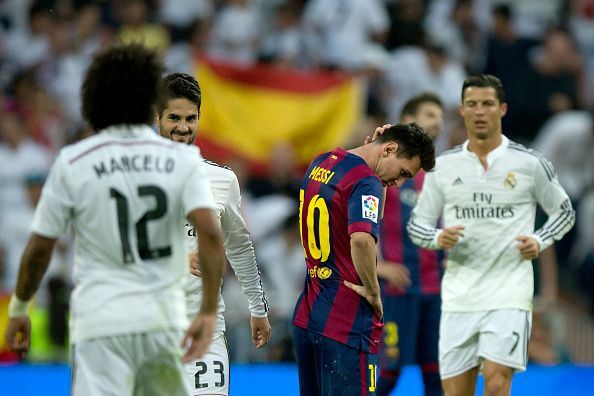 Barcelona were on a 39-game unbeaten run before seeing their streak snapped by Real Madrid in April. Barcelona’s season took a serious jolt post that match as they ended up crashing out of the Champion’s League and just managed to secure the league by one point after having a dominant lead at the top for a long parts of the season. Barcelona have been a little off their lofty standards this season. Fortunately for them, it’s still very early in the season for anything to be lost. Barcelona didn’t have a very impressive showing in November as they could eke just 2 wins out of 5 games. The other 3 games saw them being tamed by their former master Pep Guardiola at the Etihad Stadium, held to a goalless draw by a Malaga team that finished the game with 9 men and a frustrating 1-1 draw at Real Sociedad which extended their Anoeta jinx, respectively. A second-fiddle Barcelona side was unable to overcome Hercules in the Copa Del Rey in their first game of December. Real Madrid’s 6-1 win over Cultural Leonosa Copa Del Rey at the Bernabeu on Wednesday means that Zinedine Zidane has led the club to their longest unbeaten run (32 games) leapfrogging past the 31-games unbeaten spree achieved in Carlo Ancelotti’s reign in the 2013-14 season. The Madridistas will be hoping that this run is not cut short anytime soon. The club haven’t landed a La Liga trophy since the 2011-12 season and look ambitious to break the trend this season. Zidane has been an extremely influential manager since taking charge after the mid-season sacking of Rafa Benitez last season. November started for them with a topsy-turvy 3-3 draw at Legia Warsaw in the Champions League but the club managed to notch up 4 wins out of 4 after that match including a clinical 3-0 win over their neighbourhood rivals Atletico Madrid. The return of skipper Andres Iniesta will buoy the Catalan giants as they have dearly missed their midfield marshal in recent games and his presence can surely spur them on to a more fluid and incisive performance. The veteran scored a thunderbolt in the first El Clasico of last season. Jordi Alba and Jeremy Mathieu remain doubtful as they’re plagued with knee and calf injuries respectively. For Madrid, Kroos will miss out due to a broken metatarsal and young Spaniard Alvaro Morata will also be sidelined due to a knock received during the international break. The visitors will also not have the services of Welsh forward Gareth Bale as he is recovering from an ankle injury. Casemiro’s return in midfield will offer some cheer as he could prove to be vital in nullifying Barcelona’s attacks. He turned out to be Messi’s nemesis the last time the two teams clashed. Luis Enrique and Zidane have gone hammer and tongs at each other, right since their playing days. They’ve only squared off against each other once as managers yet and Zidane currently has the bragging rights over the Barcelona manager as he guided his side to a 2-1 comeback victory at the Camp Nou in April. The world awaits another potential classic football match. Barcelona are desperately in need of a result to push their title challenge while Real Madrid would not be too disappointed with a draw away at the Catalan giants’ territory. A win for Real Madrid will see the Los Blancos move 9 points clear of Barcelona at the top. Will the deadly trio of Messi-Suarez-Neymar come up with the goods or will Ronaldo inspire the visitors to another famous victory? The contest is bound to keep viewers glued in front of their TV sets.